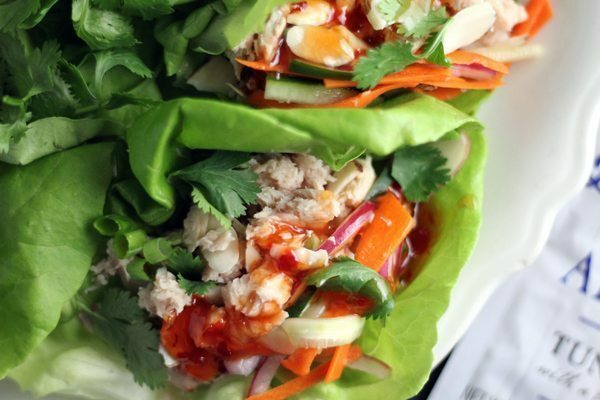 Thai Tuna Lettuce Wraps are colorful and bursting with flavor. They are totally fun to make and eat. And there is no cooking. (Yes, I repeat, NO cooking.) Sure you have to chop and slice up some veggies for the Spicy ginger Carrot Cucumber Pickle, but it is totally worth it. You get the mild flavor of white Albacore tuna + tangy vegetables + sweet Thai chili sauce + crunchy almonds and more. I am a big fan of build-your-own meals. You know what I’m talking about right? 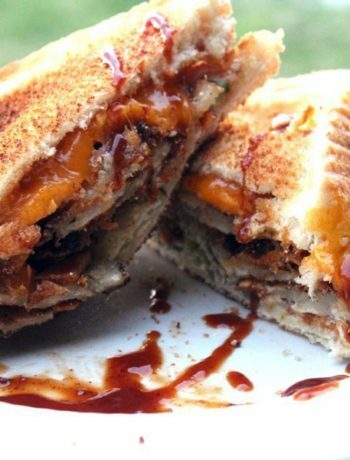 Recipes where you get to mix and match flavors and toppings to create your own personal bite of heaven. 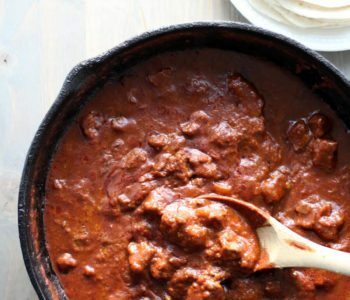 THIS recipe is just that. 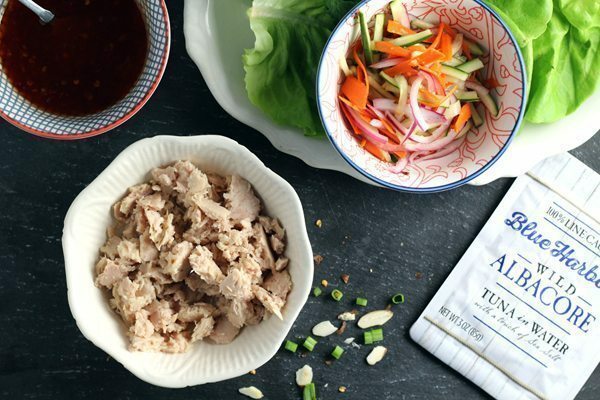 Using Blue Harbor Fish Co White Albacore Tuna, these Thai Tuna Lettuce Wraps are a new go-to for me. To bring out the best flavor we created a quick Thai-inspired Spicy Ginger Carrot Cucumber Pickle. 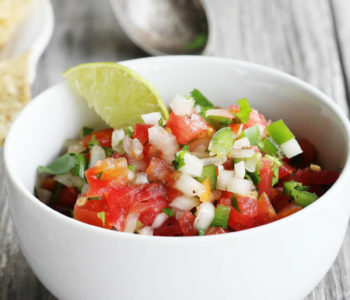 Anyone can create this in their own kitchen for a punch of flavor and crunch. Trust me, you don’t want to skip this part. The fresh carrots and cucumbers are tangy and sweet, with a hint of red pepper and ginger for spice. 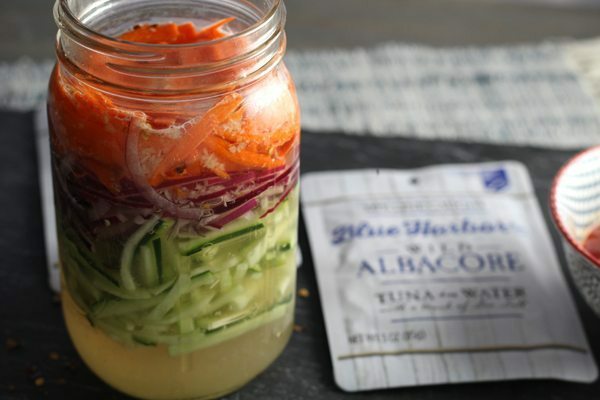 This fast-pickled topping is perfect with the Blue Harbor tuna. Blue Harbor tuna contains three ingredients. Seriously. THREE. Tuna, water, and sea salt. (They also offer a no salt added variety.) You will love the mild, clean flavor. The best part? 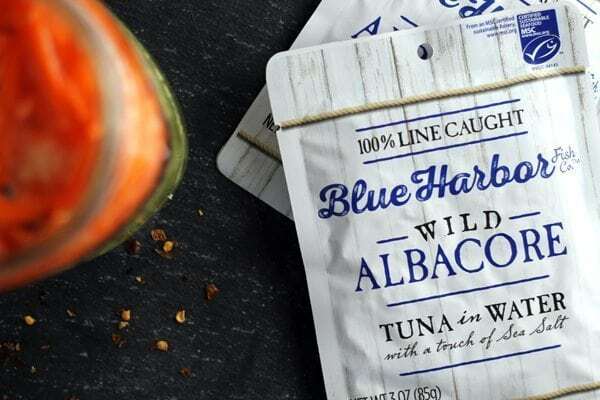 Blue Harbor tuna contains sustainably-caught wild Albacore tuna. This means that they are 100% line caught using methods to safeguard seafood supplies for the future. 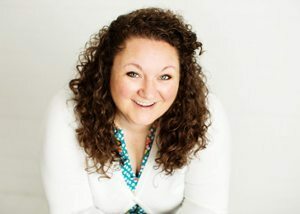 Click here to learn more about Blue Harbor Fish Co. products. All you have to do is assemble your tuna, lettuce, sauce and other toppings and dig in. 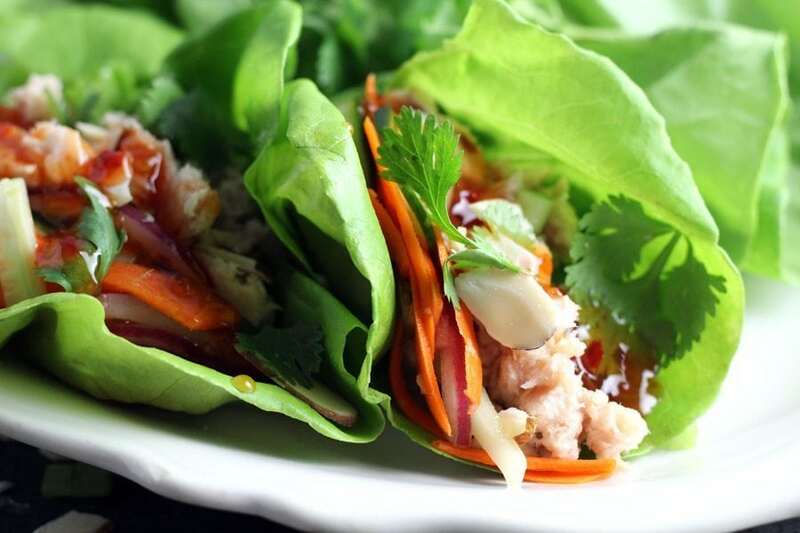 Make your own Thai Tuna Lettuce Wrap to suit your taste. My personal lettuce wrap combo is piled high with Blue Harbor Tuna and topped with a generous helping of the pickled carrot & cucumber. Then, because I am a flavor-fanatic, I drizzle on sweet & spicy Thai chili sauce, sprinkle on fresh cilantro, chopped green onions and crunchy sliced almonds. To die for! The fresh flavor and convenience of Blue Harbor tuna makes it perfect for lunch or a quick evening meal. Look for it at your favorite grocer. You can find it in pouches (no draining needed) or cans. Blue Harbor comes from Marine Stewardship Council (MSC) certified fisheries and is dedicated to the sustainability of the world’s fish supply. The MSC is an international non-profit organization established to safeguard seafood supplies for the future. This recipe idea was sponsored by Blue Harbor Fish Co. As always, But This Cook That only promotes products that we use and trust. Easy and delicious with pops of flavor, this healthy recipe for Thai inspired tuna + lettuce wraps is perfect for lunch. In a quart jar or bowl, layer the sliced cucumbers, carrots, and red onion. In a separate bowl, stir together the vinegar, water, sugar, ginger, salt and red pepper flakes. Microwave for 30-45 seconds until warm. Stir to dissolve the sugar. Pour the vinegar and ginger mixture over the sliced vegetables. Seal and shake to combine. Refrigerate for at least 30 minutes before serving. Place desired amount of tuna on top of a leaf of lettuce. Top with the ginger carrot and cucumber pickle mix, a drizzle of Thai chili sauce, fresh cilantro, green onions and almonds. 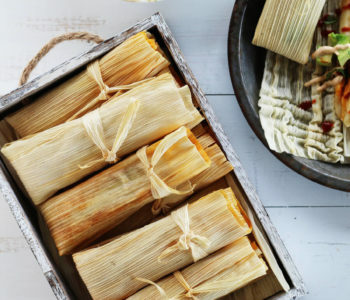 This recipe will make enough to feed 4 people. The number of lettuce wraps depends on the size of lettuce, the amount of tuna used, etc. Use more tuna as needed. What a lovely light lunch recipe! I am a huge fan of pickles so this is right up my street. A great way of jazzing up tuna! The quick pickle really went well with the tuna. The Thai-inspired Spicy Ginger Carrot Cucumber Pickle sounds like something that I would love to taste. Am sure it will go with vegetarian dishes as well. It is awesome. It would be a great topping for these tuna wraps, tuna by itself, on a salad, and more. It has a bright taste. The recipe makes a quart jar, so you will have extra. It would be great with veggie dishes. 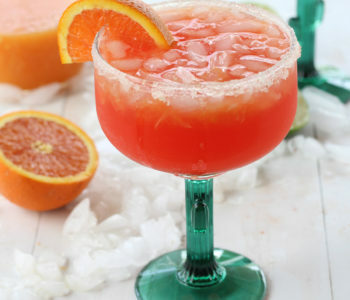 A little burst of tangy-sweet flavor. Such a nice, healthy dinner option. Looks great, saving recipe for later! Once I had all of the ingredients prepped, I had this for lunch one day, and then opened more tuna and had it for dinner the next night. So good. What a delicious and healthy lunch idea. Love the lettuce wraps…and the flavour profile here sounds amazing. Since they are so healthy…no guilt needed if you devour 2 (or 3)!! Thank you, Gloria. These really are one of my favorite recipes that I’ve created on the blog. And really isn’t a recipe so much as a flavor combination like you said. So good. wow so much goodness on this recipe. I love Thai flavors and a good tuna. Like the idea of the pickling of the veggies too. I wish I could try now. This tuna is really so good. The flavor is mild and fresh, you should look for it. 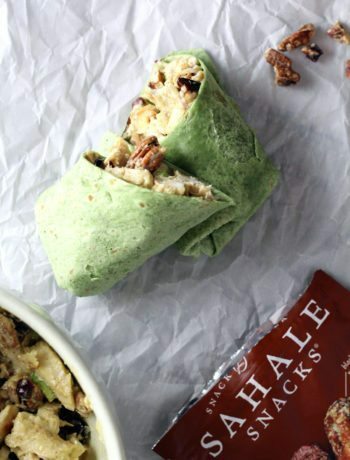 (And in the pouches = perfect for lunch. The quick pickle is so easy, my favorite part is the ginger. This sounds delicious! I have always used chicken in my lettuce wraps, I never thought to use tuna. The first time I went to a Thai restaurant, that is what we had…the chicken wraps with the peanuts and the sauce, cilantro, etc. That is what inspired me to create this version with tuna. I’ve been trying to eat lighter at lunch and this seems like a perfect thing to take in my lunchbox. It’s got plenty of flavor so I’m not going to feel cheated! Perfect for lunch. They are filling and so full of flavor. But not heavy. And they are fun to make and eat. So yum, I hope you love them. I had to have some crunch. Originally I was going to use peanuts and keep it as close to traditional Thai cuisine as possible but I was out. Almonds to the rescue. Perfect for low-carb. Just use very little of the sweet chili sauce. Absolutely love this lettuce wrap and I am already thinking of substituting the tuna with tofu for the vegetarian version. I am loving the spicy ginger carrot cucumber dressing. I love tuna, and I really enjoy it for lunch. I love the creation of your wrap with the thai flavors and the veggies. I do, too. Tuna is a staple for me, and these pouches make it very convenient..I tossed two in my purse this morning. Absolutely. The recipe makes a quart jar of the pickled vegetables, so you’ll have enough for several lunches. I love the idea of using the lettuce leaves as the wrap. I think this would make a wonderful lunch idea for those of us who are trying to watch their calories. Low in calories and high in taste — a recipe winner. Thank you, Marisa. All of the flavor and textures paired with the tuna…one of my new favorite go-to lunch ideas. 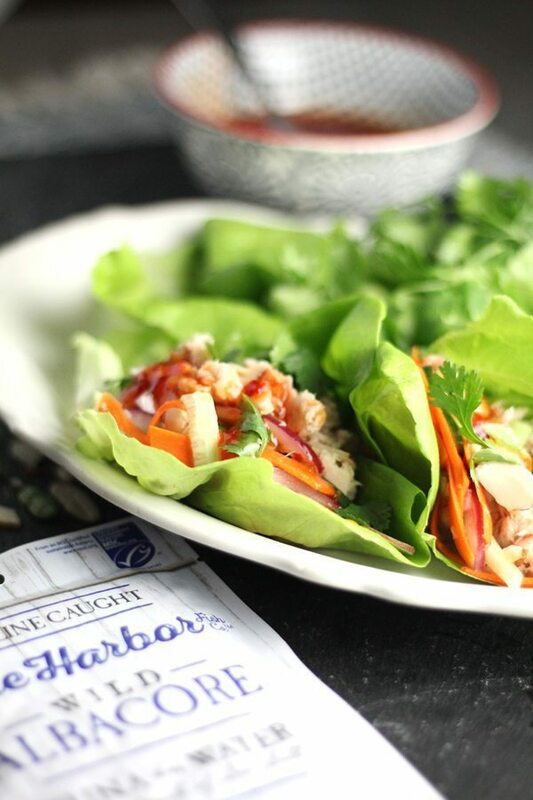 I love lettuce wraps and these are no exception! So flavorful and colorful…love the sound of these! I love lettuce wraps that are made with simple ingredients. I bet our family would love all the fresh ingredients! 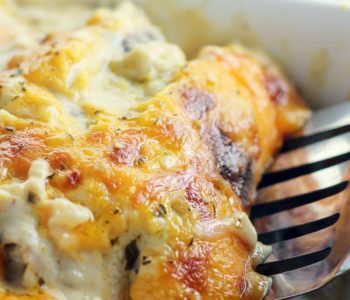 These are perfect for a busy weeknight dinner! Your lettuce wrap is great as whole meal with tuna, spicy pickle gives fresh kick with the sauce. I can dig in every day. Thank you so much, I hope you have a chance to try it.